FAQ: What are Birds Eating on my Gravel Driveway? Q. What are birds finding to eat on my gravel driveway? When you see birds foraging on your driveway, they may be looking for hard gritty materials like sand and small bits of gravel or rock, which will aid in the grinding process taking place in their gizzards. The birds I see foraging on my driveway most often are doves, jays, juncos, and chipping sparrows. As backyard bird enthusiasts, we are not often faced with the idea that one of our favorite birds is in trouble from a conservation standpoint. Chickadees and jays, goldfinches and cardinals...they all seem to be so plentiful. Nothing could take them away from us, right? Experts are constantly studying bird populations and each year, they publish The State of the Birds report. Here is a page from the 2014 report identifying some of the most common birds - birds that are not on any watch list (yet?) - but that have been experiencing rapid population declines. have lost hundreds of millions of breeding individuals in just the past 40 years." Which birds have I personally seen? Have any of them visited my yard? Are there any that really surprise me because it seems like they're so abundant or seemingly common that they just CAN'T be in trouble? We just spent a couple months at our Wild Birds Unlimited shop commemorating the loss of a massively abundant bird, the Passenger Pigeon. The loss of that bird, which used to number in the billions, is a lesson that no population of birdlife is too big to lose. This report clearly shows that bird declines are not only occuring in rare birds or birds whose habitat or food needs are very specific. Declines are occuring in our own backyard. All of us can play the role of bird conservationist, whether it is making decisions about our own habitats or contacting officials that manage lands and development, or keeping cats indoors and our windows bird-safe, or contributing financially to support the work of conservation and bird research organizations like the American Bird Conservancy, the National Audubon Society, and the Cornell Lab of Ornithology, to name a few. Let's all do our part to keep these birds, and all birds, from disappearing. Every bird we lose makes our world a sadder, duller, and quieter place to live. Here's a link to The State of the Birds 2014 report. I don't live near the shore and only get there about once a year. And then when I get there, I have to admit that I'm not very good at identifying many of the birds I find there. So I really consider myself lucky to have twice sighted a flagged shorebird. My first flagged bird was a Red Knot we saw in North Carolina in May 2011. I entered the resighting on bandedbirds.org and found out this knot had originally been flagged and banded in Brazil (date unknown). It was first resighted on Delaware Bay in May 2008 with additional resightings there in May 2009. My resighting 2 years later was the only sighting outside the Delaware Bay Area. Nine days after I saw it, it was resighted again in Mispillion Harbor, Delaware. Unfortunately, it has not been resighted again or since. Check out my post Red Knot: 65,000 Miles and Counting for more on my sighting. My most recent flagged bird was a Ruddy Turnstone we saw at East Point Lighthouse along the Jersey side of Delaware Bay. It was foraging near high tide with other turnstones, a few Red Knots, a few Short-billed Dowitchers, many Dunlin, as well as some other shorebirds I couldn't identify. I didn't see the flag while observing the flock, but noticed it as I went through photographs later. The turnstone had a lime green flag meaning it was banded in the U.S. The letters 2KE were clearly readable. He also had a metal band on his lower right leg. With that information entered into the Banded Birds site, I found out that this turnstone was originally banded on May 17, 2012 in New Jersey and was resighted 3 more times that May on the Jersey side of the bay. He returned and was resighted 5 times in 2013. My resighting on May 19 was the first of this year. It's really exciting to see a flagged bird but more importantly, I consider it an honor to contribute to the work that researchers are doing by reporting my resightings. It's so cool to think that I may help make a difference! Like thousands of other folks across the continent, I just wrapped up a weekend of counting the birds for the Great Backyard Bird Count (GBBC). This was my 7th year participating in the count. I was able to count some all four days; Saturday and Sunday I only had a couple hours available before heading into the shop, but on Friday and Monday I was around all day to count. I saw 16 different species of birds that I was able to report, including all the regulars: Black-capped Chickadee, Blue Jay, Hairy and Downy Woodpecker, Tufted Titmouse, Red- and White-breasted Nuthatch, Mourning Dove, Dark-eyed Junco, American Goldfinch, and Northern Cardinal. But it's always the less frequent birds that you love to have show up for the count, and I had a few of them this year. The male Red-bellied Woodpecker that has been frequenting my feeders since the beginning of February showed up to be counted everyday. While red-bellieds are becoming more common in upstate New York, for me they've been very infrequent, with only 4 prior sightings before this current stay. Let's hope he sticks around, establishes a territory, and finds a mate this breeding season! This winter has also brought regular visits from 2-3 American Tree Sparrows, present since the end of December. This is the first time they've ever been included in my GBBC. Purple Finches nest prolifically in my yard during the summer and regularly depart in the fall. But a small group of these gorgeous finches have returned to my yard this winter, first seen a couple weeks ago and showing up everyday for the GBBC. This was the first time I've been able to include these birds in my GBBC. Since the end of December, I've had 2 Brown Creepers around somewhat regularly. I was excited with the thought of them showing up to be counted too. Three count days went by with no creepers. The morning of day 4 passes as well without any creepers. Finally, at 3:00pm on the final day, with only 2 hours or so of daylight left, 2 creepers showed up, spirally together up the big pine tree and foraging on the snow-covered ground. Just in time to be counted! Species that showed up in bigger numbers included 23 Blue Jays, 16 goldfinches, and 11 chickadees. All in all, a nice bird count weekend, averaging 13 species and 52 individual birds each day. Another GBBC under the belt, but the counting continues...Project FeederWatch runs until early April! After finishing my second week of Project FeederWatch, I tallied the sad results and came up with only 6 species and 17 individual birds over the two-day count. It made me wonder what my counts have looked like in Week 2 of previous years and how those years turned out overall. Bird activity has been very slow at my birdfeeders this fall, the product of a wet spring and warm summer that has provided wildlife, including birds, with a lot of natural food to feast upon. This Week 2 (during the 3rd week of November), I had only Black-capped Chickadees (albeit a fair number of them - 9), American Goldfinches (3), Mourning Doves (2), and one each of Red-breasted Nuthatch, Blue Jay, and Dark-eyed Junco. Not only is the diversity of birds below average, the sheer number of birds at the feeders is way below average. The yard "regulars" that are MIA include White Breasted Nuthatches, Hairy Woodpeckers, and Downy Woodpeckers. I haven't seen a Hairy Woodpecker in weeks! And the birds here in smaller numbers than usual are the Blue Jays, Mourning Doves, and Dark-eyed Juncos. In other years, some of these week 2 counts have included some migrants such as Fox Sparrows and Common Grackles, as well as some uncommon birds to my yard like Ruffed Grouse and Cedar Waxwings. The other two PFW seasons that had lower than average Week 2 counts were 2004-05 and 2011-12. 2004-05 finished with a high species count of 12 (average of 10) and a high individual count of 68 (average of 35) with 15 different species visiting over the season. That season may have been influenced by the fact that we were just then getting into the heavy birdfeeding in our yard and it was my first year counting. 2011-12 finished with a high species count of 15 (average of 8.1) and a high individual count of 94 (average of 51) with 17 different species visiting over the season. Both these seasons finished below the average PFW counts (over 9 seasons) of 11 species and 71 individuals. If I were to use this history as a predictor of what the remaining 13-17 counts might be, I would say that this will be a BELOW AVERAGE Project FeederWatch season at my birdfeeders here in upstate New York. I will see not only fewer species but many fewer total birds. To add to this grim prediction, Ron Pittaway's Winter Finch Forecast suggests that we won't see Pine Siskins or Common Redpolls in our area this winter because of plentiful natural food sources up in Canada. My lesson here is that natural foods always trump the birdfeeders. Birds will return to birdfeeders when natural foods are either covered up by snow/ice or when those foods are depleted. Birds move to where the natural foods are plentiful. "Remember if no birds visit your feeders, this information is important. The only way scientists know when birds are missing is if the people seeing no or very few birds tell us." So I'll continue to count and continue to enter data, and hope my predictions are wrong. Either way, I'll take great joy in the few birds I'm seeing out my window this winter. ps: My final point to this post is the realization that I'm a real nerd. But a real nerd untrained in math, or statistics, or science, which makes me a dangerous nerd. But thanks for reading anyway! Can I Do Something to Make the Birds Return to My Birdfeeders? FAQ - Why Don't Birds Get Fat? Q. Why don't birds get fat? A. Unlike humans, bird bodies don't store fat. Fat, like their muscles, bones, and internal organs, have weight, and birds need to keep an ideal body weight in order to fly. So on a day-in-and-day-out basis, birds eat on an energy-in-energy-out basis. They essentially consume food as needed. Throughout a frigid winter day, they eat from sun-up to sun-down just to have the energy to stay warm that night. All night long, they burn the calories (energy) they consumed that day. And the next morning, they start all over again. Is It Spring Yet? Some Say Yes, Some Say Not Yet! The "spring begins on March 20th" definition is based on the date of the vernal equinox, an ASTRONOMICAL definition based on the earth's position in relation to the sun. The "spring begins on March 1st" definition is based on a METEOROLOGICAL definition, which is based on temperatures. There are even more interpretations out there, but these are the two most common. Bottom line is that there has been no official decree or law setting the date, so you get to decide. For me, with all the changes going on in nature already, especially with the birds, I say "it's already spring!" During winter finch irruption years like we're experiencing right now, we unfortunately start to see birds that are obviously sick or find a dead bird near our feeders. The cause if often Salmonella bacteria. Here's a good discussion on a sometimes confusing subject by Dan Gleason, who has taught ornithology at the college level for over 30 years. The usual cause of sick and dying Pine Siskins is Salmonella bacteria. There are two primary species of the Salmonella bacteria that often infect birds, but these are subdivided into over 2,300 variants. To make matters more confusing, some of these variants are sometimes referred to as if they were a separate species; e.g., Salmonella enterica typhimurium (a common type of fowl typhoid) is often simply called S. typhimurium. This can make it confusing when trying to find information online about Salmonella. One of the two species of Salmonella (S. pulorum) most often infects waterfowl and grouse, and most frequently, domestic fowl. The other species (S. enterica and its many strains) is what infects many wild birds (and people). Different species of birds can react differently to infections of Salmonella. One study on Herring Gulls showed they passed out the bacteria in their feces and showed no physical symptoms at all. Some kinds of birds show mild lethargy for a day or so, but little else. On the other end of the spectrum are Pine Siskins, which seem to be more susceptible than any other species. I don't know the physiological reasons for such differences (or if they are even known), but it seems to be the case that Pine Siskins have a much higher mortality rate from this disease. A friend of mine who has an international reputation among wildlife rehabilitators and has over 30 years of experience, tells me that she has never successfully been able to save a Pine Siskin that has been infected with Salmonella. They always die before any treatment has time to work. Salmonella is less frequent, but still very common in Evening Grosbeak, House Sparrow, Brown-headed Cowbird, Northern Cardinal, and Goldfinches (especially American). It occasionally occurs in House, Purple, and Cassin's Finch and is infrequent to rare in most other species of songbirds. Sick birds appear puffy, may exhibit difficulty swallowing, and are unusually approachable. Salmonella as a disease in birds is relatively rare in the wild, but outbreaks do occur from time to time and then we often see the evidence at our feeders. Many birds with mild infections can carry the disease without showing any symptoms and simply pass it out in their feces. But the bacteria is still active. When a susceptible individual of an easily-infected species, like the Pine Siskin, picks up the bacteria, it proliferates quickly in the infected bird's gut and is passed along to others via the feces. Salmonella is most easily passed between individuals by contact with the feces from infected birds. Pine Siskins are especially social, allowing easy transmission of the disease. Feeding in close association with one another makes it a certainty that the disease will be passed to other individuals from an infected one. What You Should Do with my Birdfeeders? It is recommended that feeders be cleaned with a 10% bleach solution (9 parts water to 1 part bleach) followed by careful rinsing and complete drying before reuse. Clean the area beneath the feeders as well, bagging the debris to be disposed of in the trash. Pine Siskins can be messy eaters and spill many seeds on the ground. It is inevitable that some of that spilled seed will be contaminated by feces. It is also recommended that feeding be stopped for a period of time (2 weeks?) to let the birds move on and not get reinfected. 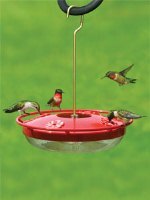 Keeping feeders clean is essential, but unfortunately, that alone will not prevent the spread of this disease. The bacteria can survive for many months on uncleaned feeders, on the ground, on plant or other surfaces. It can be passed by other birds less susceptible to the disease, by reptiles, mammals, or even some invertebrates. Total prevention is almost impossible. Once brought to a communal feeding area (which can be a feeding area in the wild or a birdfeeding station), the disease quickly spreads. Even if you are very efficient about keeping your feeders and feeding area clean, Salmonella may be brought in from surrounding wild areas. Because Pine Siskins are the most susceptible, and because they are so tame and can be numerous at feeders, we see it in them most often. However, be assured that there is nothing wrong with feeding the siskins and that this disease is just as frequent in wild areas as it is at feeders. We just see it more easily at feeders because of their high visibility. Am I Safe from the Bacteria? poisoning." It will cause extreme diarrhea and very, very intense intestinal pain. Death has been known, but is uncommon; however dehydration is typical and may be what ultimately kills the Pine Siskins. Having experienced Salmonella poisoning personally (from an unknown source), I can assure you that you do not want this. It is the single most painful experience that I have ever had. If you handle a sick or dead bird, or after handling birdfeeders where lethargic siskins have been attending, be sure to wash your hands very thoroughly (a good practice ANY time you touch a birdfeeder - sick birds or not). Keep your feeders clean and intensify doing so when many siskins are frequent, but be assured that your birdfeeders are not the cause of this naturally occurring and cyclic problem. Thank you to Dan Gleason for sharing the information for this guest post. 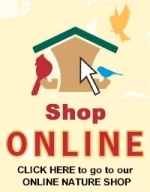 Congratulations and good luck with your new Wild Birds Unlimited shop! Dan Gleason, co-owner Wild Birds Unlimited of Eugene, OR (opening April 2013) and Instructor in Ornithology, University of Oregon. Author: "Birds! From the Inside Out" and "Looking for Yellowheads". Dan can be contacted at wbueugene@comcast.net. During our visit to Cornell Lab of Ornithology in September, we took a tour that included the Museum of Vertebrates housed there. I was on the hunt for a Passenger Pigeon specimen to photograph for my post "Too Many Doves", and to tell you the truth, wasn't even thinking of seeing an Ivory-billed Woodpecker. But there it was, a female Ivory-billed Woodpecker specimen, face-to-face with its partner in extinction, the Passenger Pigeon. She was skinny and faded, showing her age, just a shadow of her former magnificent self. But to be in her presence was amazing and humbling, and not without a hint of shame. I had nothing to do with her extinction, but I do share the consumptive habits of earlier generations that did have a hand in her demise. I do accept responsibility. Perhaps her mate was one of the males laid out in the nearby specimen tray, stretched out, chin up, wearing a faded tag reading Campephilus principalis. Both males called the Florida Keys home; one last foraged there 116 years ago - his tag marked the date: November 29, 1896. In another area of the lab, I stood in awe of a metal canister. Not just any old tape canister you'd find in grandpa's attic, but a canister holding an audio tape of the Ivory-billed Woodpecker. It was recorded in 1938 by none other than Cornell Lab of Ornithology founder Arthur A. Allen. The hubbub surrounding the Ivory-billed Woodpeckers' rediscovery in 2004 has died down, and despite hundreds of search teams and countless hours of video and audio recording in the inhospitable habitat the bird called home, more scientists are (reluctantly?) joining the camp labelling the woodpecker "extinct". But my fascination with the life and demise of this magnificent bird will never die and the honor of having been in its presence is an experience I'll never forget. All photographs were taken at the Cornell University Museum of Vertebrates housed at the Cornell Lab of Ornithology. “My” chickadee nestlings pecked their way out of their eggs on either June 3 or 4 so mom and dad chickadee are starting to get busy with the nestlings as reach their 4th or 5th birthday. My next nest check was done on June 8th, when I waited patiently for both parents to clear the box. I found the nestlings very, very deep in the nest, which made it really difficult to see them even with my handy dandy mirror. I'm always in a rush when taking nest pictures and it was even tougher this time as I tried to get an image where I could count the nestlings. I never did get one a really good picture, but here's my best shot and my attempt to count the babies. I think I see 6 birds. If that's the case, there's an unhatched egg in there somewhere. Eyes are still closed, there's no feathers yet, but those beaks are getting ready for the eating process. That's the best I could do this time around; hopefully my next check will be much clearer as the nestlings get a little bigger. I have some other good news: I have another active chickadee nest in my backyard! Unfortunately it is in a box that I cannot open to monitor. After this season, I’ll have to change to a nestbox that opens on top for easy monitoring. But stay tuned for my final 2 nest checks in my front yard box. If you are observing a nest and would like to report what you see, join Cornell Lab of Ornithology's NestWatch citizen science project. Talk to us in store if you have questions about NestWatch.